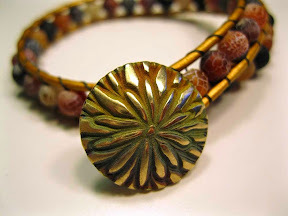 Metal Clay: how can beaders and fiber-folks use it too? What with all the ‘net-connection issues and photo-sharing dilemmas I’ve been going on about recently, I am waaaay behind in posting about upcoming workshops: sorry! I actually have a bakers-dozen on my schedule already, and I’ll write about the bulk of them as soon as I can. 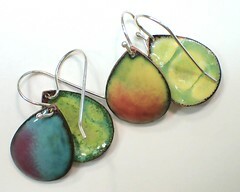 For now however: coming along soon are two metal clay workshops that are not my typical stand-alone jewelry-projects! Funny thing is, I really didn’t get into this metal clay arena because I wanted to go off making pendants and earrings and bracelets and more. My original goal was simply to find a relatively easy way to make an array of different elements because I couldn’t find ones that I wanted to use in my other creations: bead caps and clasps for my bead-work, buttons for my fiber-work, etc. If you are anything like I was, you should know that my first two classes this month harken back to those beginnings! This one is especially for Beaders: Learn to make your own fine silver bead caps, designed to go perfectly with some of the favorite beads in your stash! 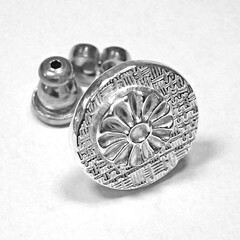 This one is especially for Fiber-Artists of all sorts: Hand-made creations deserve hand-made buttons, don’t they?! Whether they will be functional or simply decorative, they might as well be your own hand-made sterling silver treats! Click on the title of each workshop, above, and it should take you to a page where you can sign up for that particular session. Beginners are welcome! These are fun ways to add both decoration and value to your lovingly-made creations. I hope I’ll see you there! Then again, if you’re just learning about these now, and the notice is too short for you to make it work with your schedule, let me know! I can find a time to schedule the Bead Caps one again, either at Artsmiths or at my studio. I’m also happy to do one in my studio on making your own toggle clasps: as soon as enough folks tell me they’re interested, I’ll email you about picking a date that will work for everyone. And I plan to hold button-making sessions again when Indie Knit and Spin is on: we’ll be making the same sterling-silver-with-holes buttons on November 12 and, depending on interest, I’ll either repeat that one or lead a session on making shank-style buttons in bronze during their February 25, 2017, gathering. More on those, and other button-options, shortly. Yes, Thank You Indie Knit & Spin! As Cosy said at the Indie Knit and Spin site: Thank you to everyone who helped make this fall’s event yet another success: workshop students (mine and others), my fellow teachers, other vendors, all the wonderful shoppers, Cosy who organizes the whole thing, and Patty who first clued me in to this event several years ago. In theory, I can fit 10 to 12 student into my studio comfortably (probably 14 in a pinch, though I’ve never gone that far: I prefer to limit class sizes so I’m sure I can give everyone the attention they need and deserve…), this was the first time I ever tried to fit a class in behind the space I use when I set up a shop! Once I’d left some room for my shop assistant, Kathy, and for shoppers, not to mention a variety of my creations, the space left for the workshop did get a bit cosy! I managed to capture a snippet of it all in the photo here, though I couldn’t back up enough, nor squeeze into any other corners, to capture the whole space. Oh well, this shot is a nice memento of a lovely morning. I thought everyone in the class did well, and I hope they’re happy with their creations and will consider making more! (I did promise them a free firing if they did.) Also, though I can’t imagine why she’d see this (but I’m going to be vague just in case), I hope the mother of one student is delighted with the Christmas-present pendant her very focused and productive daughter managed to make in the time we had together! Even more, I hope they’ll show me / us what they’ve done with their creations, whether it’s in a comment here or by bringing them (or at least a photo) for the next Indie Knit & Spin! Cosy may not organize classes for that one but, since I did this in my own room, I can offer another button-making workshop then. Even better, in a way: if there aren’t other classes that people want to dash off to, we can have time for a slightly more complex project: instead of just making holes in our buttons to sew through, we could even explore making shank-style buttons too. Mark your calendar: that’ll be on Saturday, February 6, 2016! Yes, hand-made: Buttons at Indie Knit & Spin! The delightful Indie Knit & Spin returns to the Wilkins School Community Center this year on Saturday, November 14, 2015. The marketplace will run from 10 am to 4 pm, and there will be classes running from 9 am to 6 pm! 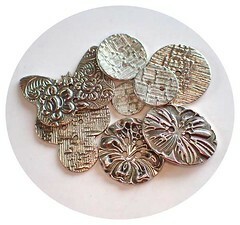 In one of those classes (10 am to 12:20 pm), I will be teaching how to make your very own silver buttons! And, you may ask, just how do metal buttons tie into an event aimed at “Everyone who loves to work with beautiful and unique yarn and fiber”? Well, the theory is this: if you’re going to go to all the effort to attend this show in order to obtain fabulous fiber arts products and materials, and then lots more time making your own hand-made creations, doesn’t it make sense to have your own hand-made buttons that you can use on those items? Though I originally announced this as a workshop using .999 fine silver (at least 99.9% silver; not 100% only because we can’t swear that there aren’t a few atoms of other stuff in there somewhere), upon some reflection it dawned on me that .960 sterling silver (at least 96% silver, with up to 4% copper) would be better for buttons. In general, I tend to make a lot of pendants and earrings and, in that context, fine silver is a wonderful material to work with. But metals-folks have been adding a touch of copper to silver for ages because that alloy yields a slightly harder, stronger product, and that’s useful for things like rings or bracelets that tend to suffer a bit more from normal wear and tear. Now, the most typical alloy, called sterling silver, is referred to as .925: i.e., it’s at least 92.5% silver, and the remaining 7.25% is usually just copper, though sometimes other metals will be included with copper in that 7.25% as well. The problem is that alloys with even just that much copper or other metals then require lots of special handling, firing and/or finishing than does true fine silver. But, there is yet another compormise: .960! That designation means it’s at least 96% silver. With that mix, you get (roughly) 90% of the strength of .925 sterling with almost none of the extra complications! So I’m now planning to use .960 for the class, though I will have a bit of .999 on hand just in case anyone signed up specifically because I’d said we’d use fine silver. But I’m assuming the students will all be metal clay beginners, and happy to use the product the teacher is recommending for their buttons. I’d also said that it’d take just a minor adjustment to turn a button-project into one where the person is making charms, earring elements, or small pendants. We can make any of those out of .999 fine silver or .960 sterling silver. Last I heard, there were still just few seats left. If you’ve been looking for a good introduction to metal clays, why not sign up for that session! Or, if you can’t make it that Saturday, let me know if you’d be interested and able to come over the next day, on Sunday the 15th. 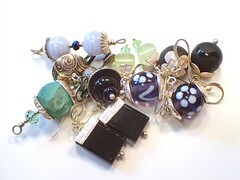 I’m hoping to offer another little introductory session then: the focus will be small earring, charm, or pendant pieces.